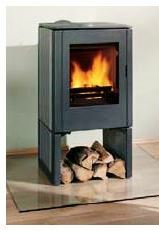 Replacement Fire & Stove Glass to suit a wide range of gas & electric fires and gas, wood burning and multi-fuel stoves. Here at Northfield Glass Centre Ltd, we supply high quality 3mm, 4mm & 5mm, replacement fire & stove glass for gas, wood burning and multi fuel stoves and fires. All of our glass is cut to order especially for you. Robax™ Glass for all your high temperature needs. ROBAX® is unstressed unlike tempered glass and can supply all of your replacement high temperature glass requirements. Northfield Glass Centre can custom cut and finish Robax glass. This material is actually a transparent glass-ceramic. Ceramic glass has a thermal endurance way beyond that of normal tempered glass. Tempered glass is generally limited to applications that do not exceed 500F. However, ROBAX® is designed to operate at temperatures ranging from minus 400F. to plus 1400F. It can be tested from fire to ice without breaking. Spark & Flame Guard panels.